Limited capacity in the next cohort of fellows. Sign up early to avoid the waitlist. Pathrise invests in students or tech professionals by providing personalized advice and training on how to get the best possible internship or job. The program is completely free upfront. Pathrise fellows pay zero tuition until they land an offer they are happy with and get hired. 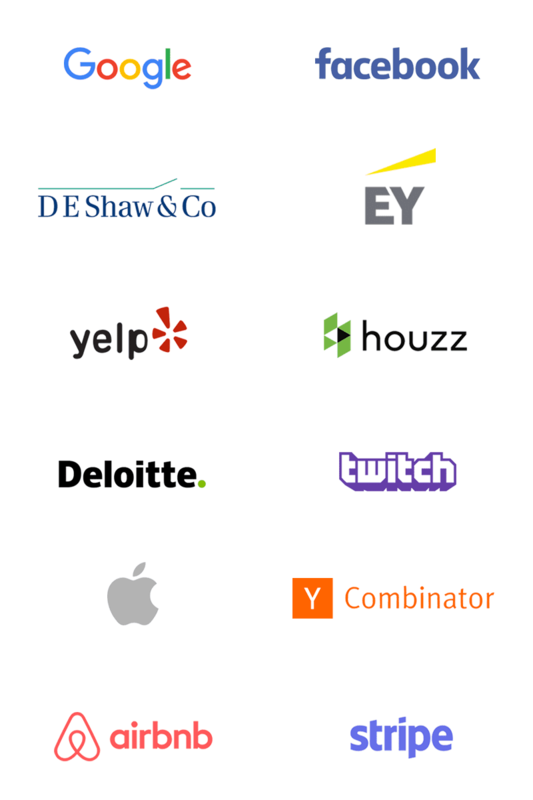 We've brought together only the best advisors from Google, Facebook, Apple, and other top companies, big and small. Learn online with live video sessions tailored to suit your schedule, including unlimited support whenever you want. Have 1-on-1s and small groups with your advisor, who works with you face-to-face every week until you get hired. We've worked with over a hundred fellows and counting. Read their stories here. Our network consists of both part-time and full-time advisors. See some of their profiles here. Is Pathrise really worth 9% of my salary for a year? We understand that 9% is a big commitment, but we have to emphasize that every fellow that participates in Pathrise improves their job seeking prospects by astronomically more than just 9%. Beyond just getting you better opportunities with higher salaries, our negotiation advice alone can account for a salary increase of over 10%. Every single part of our program, from teaching you how to do outreach that will 4X your response rate (5% to 20%) to interview preparation that improves your coding test scores by at least 50%, is designed to statistically improve your job prospects way more than what you commit in return. How much of a time commitment is the accelerator? Though the specific timing varies for each individual, you can expect the Pathrise program to take 10 hours a week until you get hired (including your actual interviews). Most of our fellows apply for positions, interview, hear back and sign a final offer within 3 months, but we are willing to support you for as long as you need to get hired, as long as you are still committed. We expect our fellows to be consistently committed to the program, but are happy to be flexible during hectic times, like before a big exam or project deadline. Can I focus more on the topics that are the most helpful to me? Of course! The Pathrise program is completely personalized to your unique situation. Because our fellows have ranged from undergrads looking for a summer internship to PhDs looking to enter a specific industry, we heavily modify the curriculum to suit individual circumstances. We never give you busywork. Instead, we invest that saved time into helping you with the other parts of the job seeking process you could use more help with. Got more questions? Read our FAQ or contact us here.